Oxidative stress and cell cycle reentry lead to cell death in the harlequin mouse. 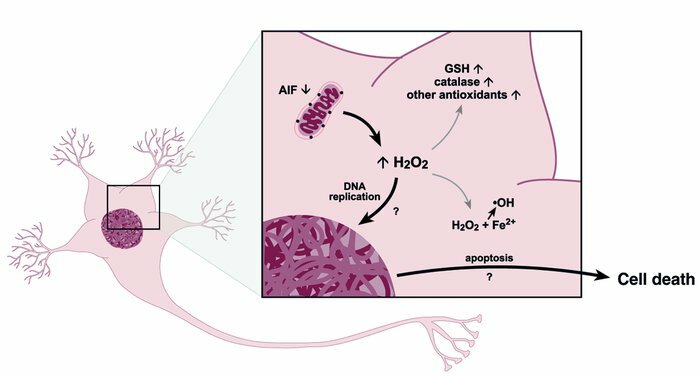 An 80% reduction of AIF protein expression in the Hq mutant mouse is associated with increased activity of total glutathione (GSH) and catalase, presumably through increases in hydrogen peroxide (H2O2). Surviving neurons may express additional antioxidant pathways. Increases in H2O2 could lead to cellular damage via formation of hydroxyl radicals (•OH) by the Fenton reaction. In addition, oxidative stress may trigger cell cycle reentry in some terminally differentiated neurons. These neurons undergo apoptosis after DNA replication. Possible mechanisms for cell cycle reentry are shown in Figure 2.